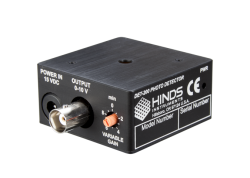 Hinds’ detection systems are specifically designed for use with high frequency optical signals including those generated in Photoelastic Modulator (PEM) applications. The DET-200 dimensions are 2” x 2” x 1” and have a #8-32 tapped hole for post mounting. The following detectors are suitable for signals in the 0.05mW to 5 mW range. For lower signal levels Hinds developed our avalanche diode photodetector, the APD-100.